Great value mattress and bed frame package. Choice of mattress to suit your needs. 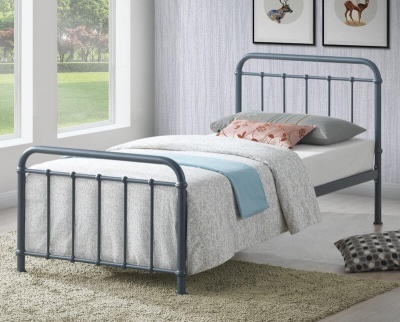 With its simple design the Brennington metal bed frame suits most modern homes. The under bed clearance/storage space is 31.5 cm. Choose between the following sprung mattresses. Slumber sleep open coil spring mattress. The Venus mattresses uses premium open coil springs. This mattress gives extra support to the back and neck and offers durability and comfort. Finished in a high quality damask fabric and decorative buttons. Slumber sleep medium orthopaedic mattress. Manufactured to high standard using premium open coil orthopaedic springs. High quality components give extra support to the neck and back and a 12.5 high gauge frame offer real durability and comfort. Finish in a high quality damask fabric with decorative buttons. Both mattresses are made in the UK and pass all relevant fire safety standards. The bed frame is flat packed for home assembly full instructions included. The bed frame has a two years product guarantee for added peace of mind.